You can also add diced Granny Smith apples (peeled and cored) or grapes too. 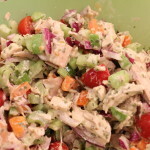 Combine the chopped chicken with all of the chopped veggies through the cherry tomatoes and toss in a large bowl. Add the rest of the ingredients through the lemon juice and mix well. OR if you'd like to taste the tartar sauce/dijon/tarragon/lemon juice mixture beforehand, mix these ingredients in a separate bowl to taste. Season with salt and pepper and assemble your sandwich.